In chanoyu tea rooms of four-and-a-half mats or more are called hiroma and those of four-and-a-half mats or less are called koma. Four-and-a-half mats can be either hiroma or koma. In the koma, daisu (formal utensil stand) or other utensil stands are not used, so these tea rooms are only used for hakobidemae . In the hiroma, the daisu and various other stands can be used with utensils displayed on the stands. In short, the koma is the world of wabi-cha and the hiroma is the world of the shoin (formal reception room). In the koma, the toko (alcove) is only place to display things, but in the hiroma there are utensil stands and tsukeshoin (study areas) as well as toko. The ceiling of the koma is low, and the entrance is small, whereas the hiroma is the same as a normal drawing room, with an irikawa (long narrow passageway between the zashiki and the verandah) and a verandah. 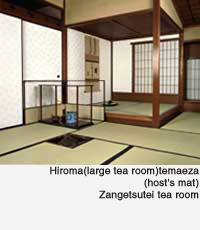 A four-and-a-half mat daime tea room is larger than a four-and-a-half mat room, but such daimegamae tea rooms, are for koma-style temae and so cannot be called hiroma. The word chashitsu, meaning tea room became widely used in recent times. Previously tea rooms were simply called zashiki or kozashiki (small zashiki). Or they were named according to their size, for example yojohan (four-and-a-half mat), sanjo (three mat) and so on. Furuta Oribe and Kobori Enshu called them sukiya. These days a room which is only used for chanoyu is called a chashitsu and a building which is made with a rather free and easy design like a tea house is called a sukiya.